My attempt two weeks ago to make a buttermilk orange chess pie turned into a big goopy mess but the idea of it was still irresistible. Who could resist a creamsicle-flavored Orange Julius inspired pie? I was determined for a do-over but this time with a different recipe. But all I really needed was a tweak of that and a pinch of this. Devilishly Delicious! Growing up, I distinctly remember hanging out at the local mall and lining up for an icy cold, frothy Orange Julius. I'd be surprised if most people haven't tried this beverage - a mixture of orange juice, sweetener, milk, powered egg whites and vanilla flavoring - at least once. 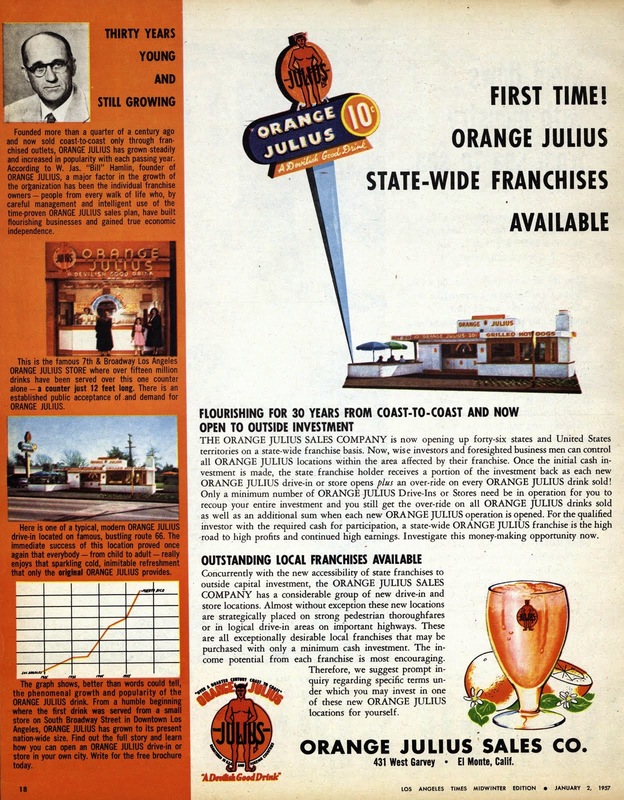 Did you know that the drink grew out of an orange juice stand in Los Angles in 1926 by Julius Freed? His real estate broker, Bill Hamlin, couldn't handle the acidity of plain OJ and developed a mixture that gave him less of a bellyache. Freed started serving this frothier, creamier textured drink at his stands. Folks lined up at the stand shouting, "Give me an Orange, Julius!" The new drink would eventually be known as Orange Julius. It was named as the official drink of the 1964 New York World's Fair. In 1987, the chain was bought by Dairy Queen. In a large mixing bowl, combine orange and lemon zest, and both sugars using your fingers. Add cornmeal, flour, and salt. Stir in melted butter. Add eggs, mixing well between each addition. When all the eggs are added, stir filling briskly until thickened and light in color. Stir in buttermilk, lemon juice, orange juice, and vanilla extract. Strain mixture into partial pre baked pie crust and place in preheated oven. Bake until the edges are puffed up and set and the center jiggles just a tad when nudged. The top will be golden brown. About 40 to 50 minutes. Don't over-bake. Bake on baking sheet until pastry is set and edge is pale golden, about 15 minutes. Carefully remove foil, then bake shell another 5 minutes, just until crust is dry but not browned. Cool shell completely.